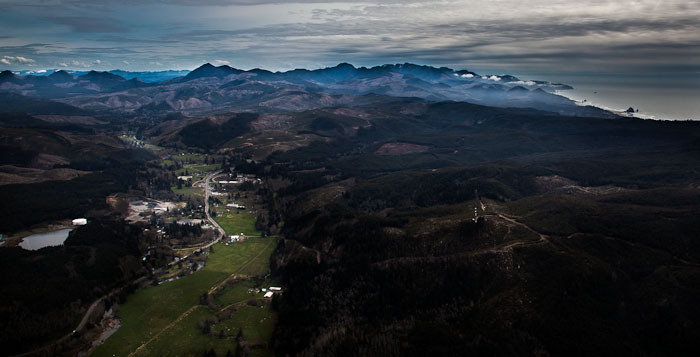 A gift of taking a helicopter ride over Seaside and Cannon Beach, Oregon was given to my wife and I. Many thoughts ran through my head after my initial excitement as I love to fly. I couldn’t decide whether or not to take still photos or shoot some video. When the time came to get on the helicopter, I decided to do both, shooting video with my GoPro in one hand and shooting stills with my 5D MK II in the other. With this being a quick flight, I didn’t have time to adjust settings on the 5D so I just set it to automatic and let the camera do the work. I felt a little awkward handling both cameras, but the pilot of the helicopter was appreciative of my determination to capture the beauty of the 15-minute ride. Given that I didn’t have much time to compose my images, I came out with a couple of descent still shots shooting through glass as well as video good enough to capture the memory. The first of my favorite shots is of Cannon Beach from a distance. You can easily see Haystack Rock in the distance and the cloud formations are what I think made this photo interesting. The second photo is an aerial view of the road leading to Cannon Beach from Seaside. The views were just gorgeous; it was perfect weather for a flight. You can see Haystack Rock in the upper right part of the photo. Below is the video shot from the helicopter showing the towns of Seaside, Cannon Beach, and the mountains that define the Oregon Coast.